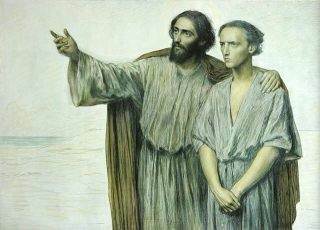 As soon as they left the synagogue, they went with James and John to the home of Simon and Andrew. Simons mother-in-law was in bed with a fever, and they immediately told Jesus about her. When my pastor has the good sense to wrap up his sermon at a decent hour, I can avoid bolting out of the building like the anti-social person I really am and still make it to my favorite restaurant before the masses fill the place. There, I can share the morning’s gossip with my family before shuttling home to see how badly the Chiefs are being beaten. Once the ball game is over, I’ll lounge about the house for a few hours. If I have to go back to church for some meeting or other, I’ll do that, but often I get to relax my way all the way to bedtime. Sundays are marvelous. How often do we walk out of church and then allow the world’s demands to sweep us away from the things that we should do. We get swept into the ads for flashy electronics or the latest movie-of-the-decade. We watch the Chiefs lose or the rest of the family snooze. Back in the pews, we had great intentions to visit the afflicted and pray like crazy, but once we arrive home, things…change. The point of a worship service is not to give us our religion fix, to fill us up like we do our car at the gas pump. Or maybe it is. Maybe we worship together in order to be able to drive off and actually go somewhere for God. You’d never consider filling up with unleaded on Sunday afternoon and then pulling away from the pump and leaving the car idling until the gas gauge read “E,” would you? That would be pointless and wasteful. How much more pointless and wasteful is it to “fuel up” on Sunday morning only to idle away our time through the week. Instead, let’s leave church and launch into mission–immediately.